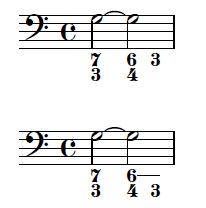 I am currently reproducing a continuo part, and am having trouble achieving a particular effect: printing a continuo figure in the lower position only. So in the first example in the attached image, I want the '3' to appear on the lower line, at the same height as the '4' to the left of it. And while I'm here: is there any easy way of adjusting the font size of the continuo figures, but not the symbols (#, b, etc)?